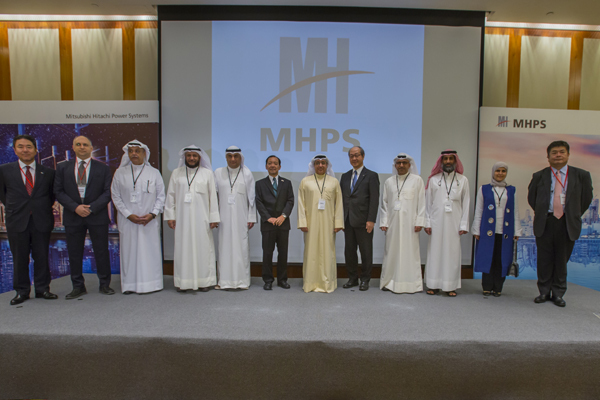 Japan's Mitsubishi Hitachi Power Systems (MHPS) showcased its cutting-edge power changing technologies at a key technology seminar held today (April 8) in Kuwait City, which was centered on gas turbine combined-cycle power generation systems. In an impressive display of Japanese technological advancement and efficiency and Kuwaiti far-sightedness and ambition, Mitsubishi Hitachi Power Systems (MHPS) unveiled its innovative technologies that are changing the landscape of the energy sector, said a statement from tthe Japanese group. The increasing demand for electricity, the desire to introduce natural gas as the fuel of choice and the need to provide reliable power are essential to implementing the government’s priority to significantly reduce its dependence on oil and drive diversification of the power sector, it added. Attended by a host of dignitaries including Engineer Mohammad Boshehri, Undersecretary for Electricity and Water in Kuwait and Takashi Ahiski, Ambassador of Japan to Kuwait, the event illustrated how the precision engineering of MHPS Gas Turbines today can enhance, and advance, low cost wind and solar energy supplies. Speaking at the event, Boshehri said: "We are ambitious here in Kuwait, and we want to lead the region, and the world, in creating the most advanced, reliable, diversified and sustainable energy sector on the planet. We want to develop an energy landscape that shows the world power beyond carbon - clean power built to last." As a global leader in supply of equipment and services to the power generation market - including the world’s most advanced and reliable gas turbine series – MHPS is working across the region advancing the next generation of power, said the statement. Significantly, in Kuwait, MHPS is fueling the deployment of new technologies and also supporting the nation by helping to nurture and develop local talent through a close partnership, it added. Chief Technical Officer Akimasa Muyama said: "Our partnerships here in Kuwait are a shining example of the collaboration and connectivity that can deliver significant transformation in the sector. What this proves is that, for change to happen, strong partnerships are essential." "Also a depth of understanding of the customer is essential besides long-term investment." Kuwait’s electric power sector, stated Muyama, was currently in the midst of transformation, replacing oil-fired plants with natural gas or renewable energy to trim or eliminate carbon. "The increase in renewable energy requires addressing the issue of power system stability. MHPS’s, latest generation of gas turbine technologies combined with MHPS digital solutions are capable of ensuring a stable energy supply for Kuwait," he added.